This months project comes from Calder Ceramics and is an adapted potter’s take on doing the “fluid acrylic pour” … but we are going to use this technique on clay, with stains (or underglaze colors) and slip! 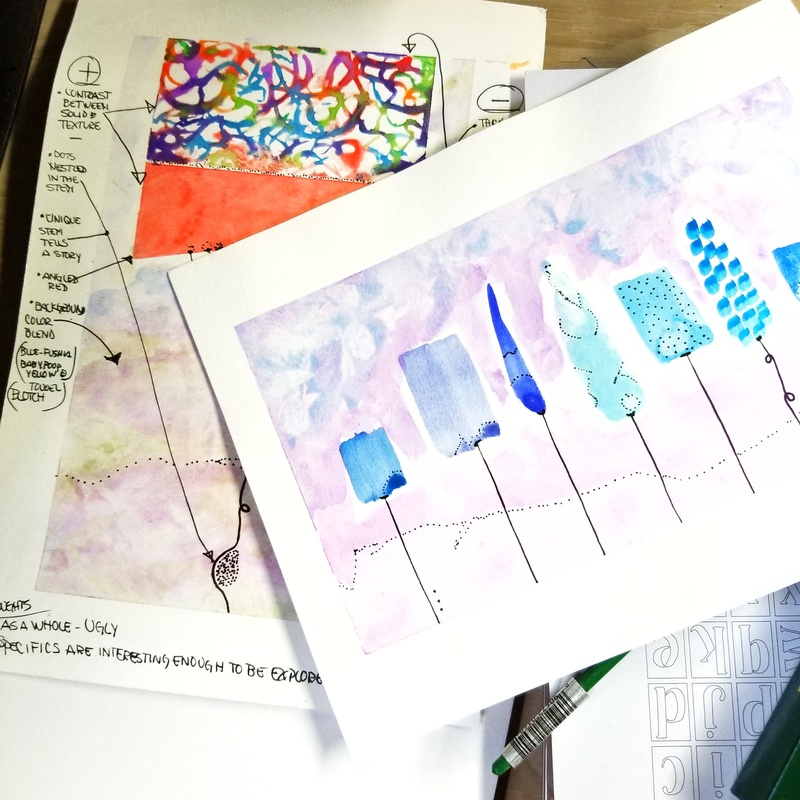 Notes From Tammy Jo: I see this project as something that can be applied to whatever form you are currently working on in your studios. I’ve included the acrylic pour video (as an alternative option) for those using air dry clay and possibly inspire others in the possibilities not yet explored by this single video! (Example: Since I don’t have any stains in the studio, I’ve decided to alter the directions and try using underglazes to color the slip and some varnish to create resist designs. 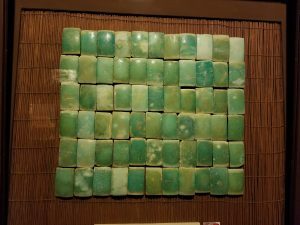 Colored Mason Stains or Underglaze colors. Share Your Experiences With This Technique in the Facebook Hobby Potter Life Group! This week began with big plans, big accomplishments, and an unstoppable spirit! It felt strangely reminiscent of the 365 Day Cup project and even more interestingly it followed the same path. Big dreams, unstoppable spirit … and big challenges in the beginning phases! So I sat down and ran the numbers to see what it would take to get The “Dinnerware Dash” project completed on time. 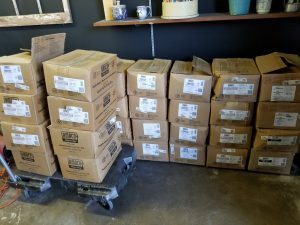 To recap, I planned to make dinnerware pieces by using the 1250 lbs of brown stoneware to earn money to purchase porcelain. All this by the end of March! It was a hefty order…unfortunately a little too hefty. Figuring in throwing time (50 lbs per day for 25 days straight) so that I have sufficient drying time (during the rain winter), firing bisque, glazing and glaze firing times for all the volume … it was just not feasible with the equipment and schedule I have. I’m going to be throwing / handbuilding daily, until the 15th of February. Using as much clay as I possibly can, to create unique dinnerware sets … the key word here is UNIQUE! Look forward to it! When not in my studio I’ve been exploring concepts I’d like to try in porcelain (once I get some). I’ve taken to watercolor imagery to express form and texture I’d like to incorporate into my clay dialogue… here is a copy of examples. Tomorrow (Wednesday) starts my first day back in the studio to get some heavy duty clay work done … tomorrow seems so far away! 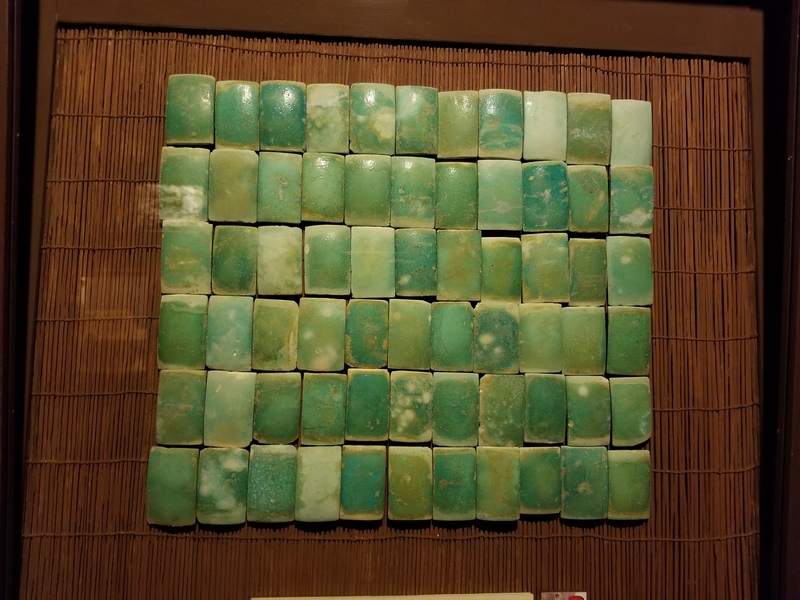 Last week we had a whirlwind tour of the Egyptian Museum (where a fingerprint in clay started my interest in pottery). Unfortunately, it was a strange week and I lost all my video files and had to do a recap (but thankfully the phone still functioned and could be reset). Here is this weeks video! This week, most of my time was spent deciding on my future in clay and putting the (cold) studio in order (this actually is taking much longer than anticipated … the whole week)! Being a self-taught potter has its perks and its perils! The first is you need to be self-motivated, to take responsibility for your course, and also be able to pull together a vision that will move you forward. I wanted to gather a visual representation of the most inspiring imagery I can quickly reflect on when I’m in the studio. There are artists, techniques, imagery, color, form, and ideas. that motivational when looking at them. My dream/goal is to pull together the “essence” and qualities I love about this imagery and create a unique style I adore creating! DEVELOPING CREATIVITY – WHAT SEASON IS MY DEVELOPMENT? The bottom-line conclusion this week? I found myself smack dab in the Emulation Phase but pretty close to crossing over to the Divergence Phase (which was exciting!) So in order to fully explore my visions, I’m more determined than ever to clear out my excess brown speckled stoneware and extra glazes in favor of some nice white porcelain! 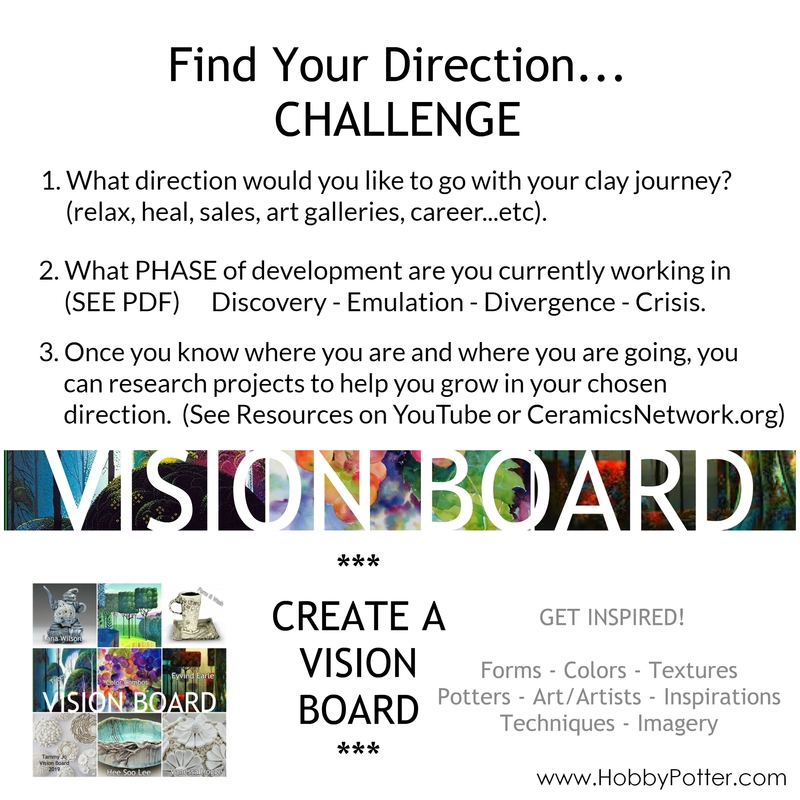 Want to Join Me In Creating Your Own Clay Journey Vision Board? 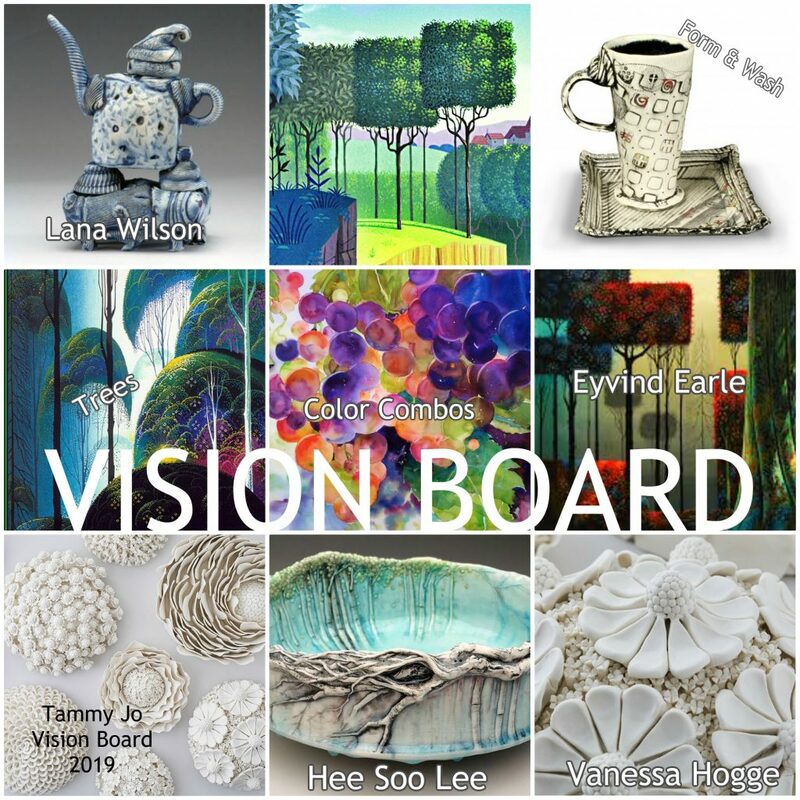 How to Create Your Artistic Vision Board! Happy New Year My Pottery Friends! I’m beyond excited to get started working on a new clay focus for 2019! From “clay play” to “clay practice”, I hope to move my learning experiences to more intentional fun that is for both personal growth and technique mastery. 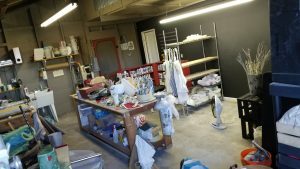 After 8 years of enjoying ceramics with a whimsical, randomness about learning, I wanted to streamline my studio, my ideas and really work to create the inspirations in my head. It just feels like the time. The term “Finding Your Voice” is such an ambiguous phrase in the art world. You hear it, you aren’t really sure what it is, but you just know you need it. So I’ve decided my mission this year is to work on an authentic clay practice to cure the “ceramic laryngitis” and create work that speaks (and had a lot to say like me lol)! EPISODE 1.1 This Weeks Episode! As some of you know, my history in clay began as a prescription from a doctor; it was to find a healing hobby for relaxation. My glimmer of potter began 35 years ago when I was 17 and working at the Egyptian Museum in San Jose, CA. While cleaning glass I noticed and became fascinated with a fingerprint in the ancient pieces of pottery. I wanted to go back to the beginning to find the root of my inspiration … just to see it again! In life, we all have those “squeaky doors”. Those things that just keep nagging at us to take care of. They aren’t urgent, but they still nag at you… like a squeaky door! My studio is full of these squeaky doors and it comes in the form of clay, glazes, and designs that don’t work. Before investing another penny on my clay trek, I had to make some serious decisions. Porcelain has always been my true desire to learn and work with, but currently, have 35 boxes of stoneware and red earthenware clay in my studio. This is the furthest thing from pure white when it comes to clay! I realize they are a blessing and am grateful been blessed with an ABUNDANCE of supplies, and am grateful. Yet I now realize it’s like my favorite saying goes, “Enough is as good as a feast”. This feast mentality is all over my studio and I just need to streamline it more to my minimalistic liking. 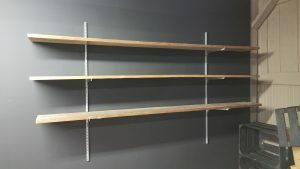 Next week I will be planning my projects and taking care of finishing the shop so I can whip out my clay … I can’t wait! ~ Tammy Jo! How Can I Help ? – Pottery – Resources – Life! My Bucket List for 2019 is growing – I’M SO EXCITED! As I contemplate my next adventures, they wouldn’t feel complete if I didn’t pair them with my favorite necessities … ALL OF YOU! 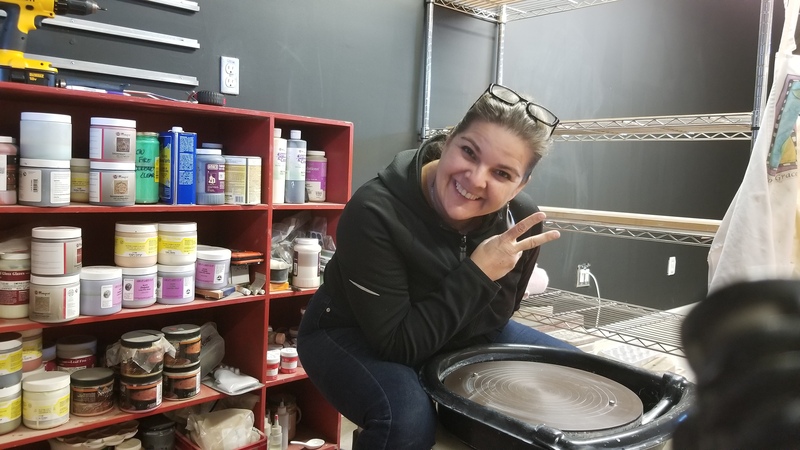 You are so much a part of what inspires me, and our warm community of “hobby potters ” is an essential encouragement for any new or seasoned clay junkie. Clay feeds into all areas of my life, it strengthens my faith, relaxes me, heals me, continually trains my patience and always leads me to meet the most FANTASTIC folks who share a kindred spirit! For me, it’s really more than a hobby and runs deeper than just a desire to “play with clay”. It’s the excitement of hearing someone experience an “aha” moment at a success or failure. It’s motivating someone with a gentle“kick in the backside” to take a risk in clay. It is being here for the person struggling through life’s challenges and giving them respite to regroup and just be able to enjoy a simple clay adventure until they can begin their own. I love it all! This next video year, as I check off my Bucket List items, I’ll continue to “keep it real” and add some of YOUR good stuff as I’m living mine! I’ll most definitely be sharing my studio happenings, clay projects, some destination adventures and all the resources I scoop up along the way. Plus I want to share some inspiring stories and questions from fellow potters and ceramic artists BUT I NEED YOUR HELP! Besides asking for a million dollars … I’d like to answer or share encouragement from you in my videos!! Please post in our FACEBOOK GROUP or send me a personal message through Facebook or Instagram! Enjoying the Clay Journey With You! I wanted to take this time to say …..there are not enough words to say… how much I appreciate and am thankful for each and every one of you! You have filled my year with fun, friendship, clay, learning adventures, and love. Let’s not forget, lots and lots of personal growth sprinkled in! 2018’s goal was to bring together like-minded clay enthusiasts into a community (newsletter & Facebook Group) to learn and inspire each other through our individual pottery journey’s while working on a common themed free monthly project. I LOVED this time with all of you. Hopefully, you all have enjoyed these projects and made warm lasting friendships along the way! 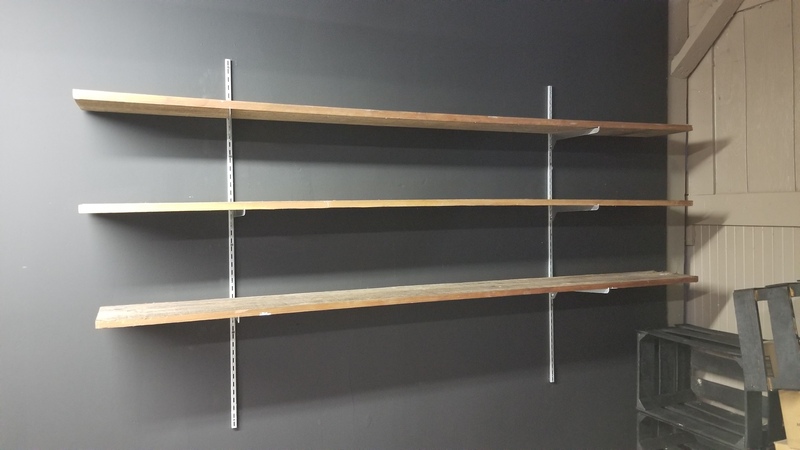 Yes, it’s true, December will be the last official project installation and our grand finale of monthly projects. If you have been with me through this year..thank you so much and CONGRATULATIONS! 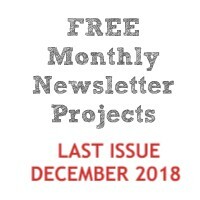 (If you wish to save the project notes from this past year please visit the archives / Past Issues of one of your newsletters and PRINT them for your records before December 31, 2018). With the brief hiatus from sharing my clay journey through video, I’ve decided to head away from my laptop and back into the studio! (if you want to get notices just subscribe and “ring the bell” for notifications to easily follow along). MY HOBBY POTTER BUCKET LIST? As always, this personal video/vlog journey will keep me accountable in the studio, as I actively check off pottery bucket list items. What would YOU like to accomplish in the next year? Don’t put it off… Are there places, people, adventures in clay that you think will really excite and make a difference in your work? 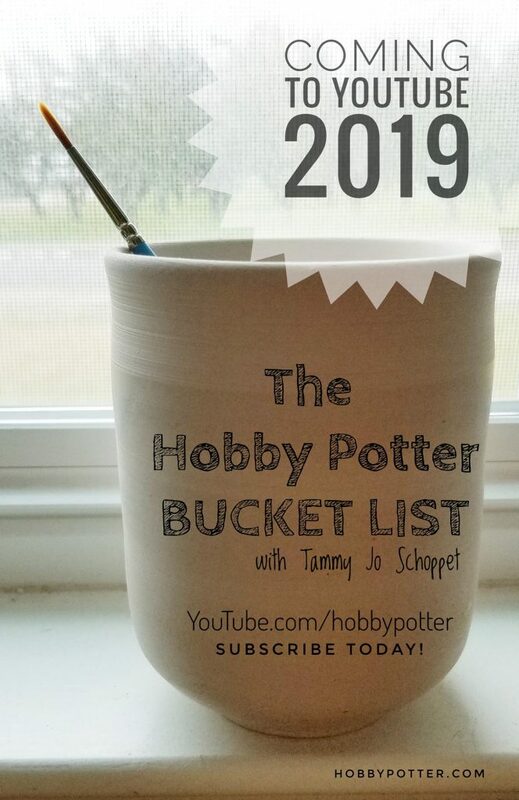 (If you don’t aim at a target, your chances of hitting it are slim) Join me in stretching yourself with your own personalized Hobby Potter Bucket List and learn what moves you in clay. So full gratitude for this past year of doing projects together with you! My hope this that people continue to make a connection to each other and to their clay. If I played any kind of role in helping people find the joy of clay … mission accomplished! What an amazing pottery journey this has been! January 1, 2011 is the date I consider to be the beginning of my “Hobby Potter” life. It’s when I got serious about clay and began creating YouTube videos to “direct myself” (learn) pottery making and ceramics. 2018 marks 7 YEARS ! Along the way I’ve made some beautiful friendships, learned a lot (with still more to be learned) and have tremendously enjoyed this clay journey! Self-Taught vs Self-Directed: Before sharing the process I use to grow in my pottery practice, I feel the need to clarify some terminology. “Self Taught” means you had no help what-so-ever from others, and learned techniques completely on your own. “Self-Directed” means you charted your own course of learning and used resources from professionals to learn the craft. Since I’ve never officially taken a pottery class and I learned primarily through YouTube videos, books and suggestions/critiques from fellow potters who I see as mentors, I’m a Self-Directed potter! From time to time I get asked this question? Choose Projects To Help You Learn a Specific Technique or Skill (such as throwing a cup, handbuilding a pitcher, texturing, mixing glazes…etc.). Books are great, but it’s also crucial to see live demonstrations. 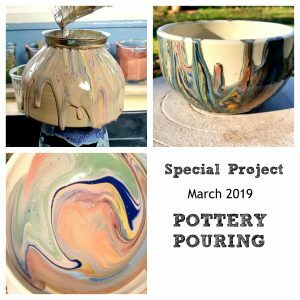 There are some amazing teachers out there and even actual online pottery classes (ClayShare with Jessica Putnam-Phillips) that can guide you. Being in community with other potters and getting live critiques will also help you improve more quickly. Figure out a way to keep repetitive practice fun…this is HUGE on my list! It’s got to be fun if it’s going to get done! (I’m no fan of doing the same thing twice, but I do understand that I can only improve with repetitious efforts). How did I get it done? The 365 Day cup project allowed me to throw on the pottery wheel everyday, but I made every cup look different so it didn’t feel repetitious. Be accountable to somebody: (pottery group, Facebook friends, the YouTube verse ;). When I had no one around me that worked with clay, I started my Hobby Potter YouTube Channel to create a community where I had none. Share What You’ve Learned: My videos are not “instructional” and were never meant to be, but hopefully they are “educational” in the sense that other newbie potters can see another newbie pottery taking chances. If what I’m personally learning is shareable (good or bad) it becomes a reference of realistic application to someone in the learning process. Without the ability to be in a classroom setting and gleaning from those sitting around you, “real deal” videos can be helpful to beginners who might become discouraged if a project doesn’t turn out “picture perfect”. Some of my biggest disasters go into the kiln and come out as some of my greatest successes. 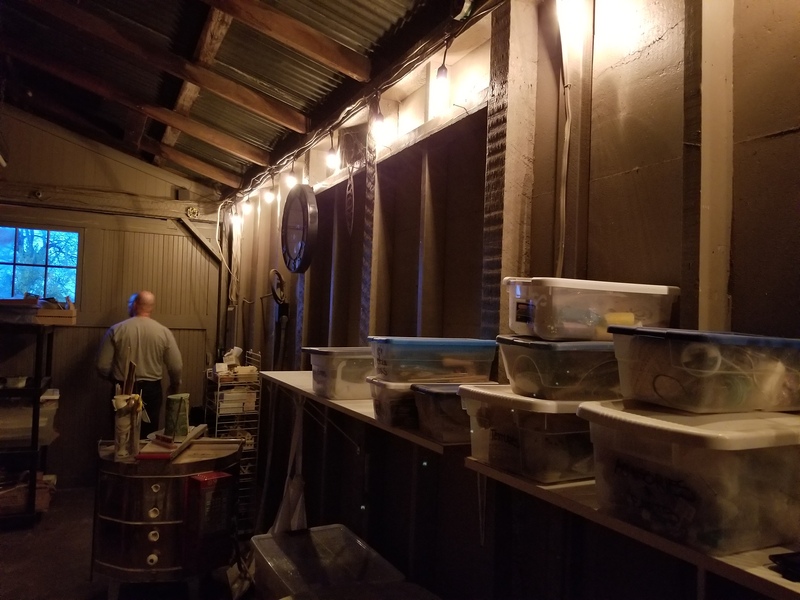 I’ve realized no matter how long I’m into clay, the exciting mystery of a kiln opening is like Christmas, because you never know what can happen! 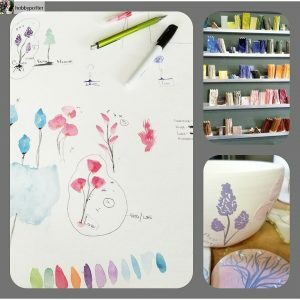 I would encourage everyone looking to grow in pottery go for it! Figure out what you want to learn, embrace the journey and relax your way through! 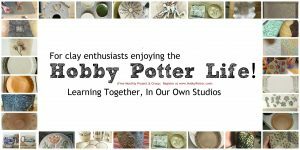 You can join our current project Newsletter Group for Hobby Potters!